Those are just some of the reviews that have been posted by Junk King St. Petersburg customers within the last couple of days. There also very typical of all the reviews submitted by customers who have had exceptional experience with junk hauling when they hire Junk King St. Petersburg. What makes this company so great to work with? Clearly, it is the friendly attitude of the workers. That matters a lot especially when you are inviting someone into your home to provide a service. Not only of the crews for Junk King St. Petersburg friendly but there also licensed and insured. That makes them totally trustworthy. They also have a lot of experience with moving all kinds of objects at of all kinds of situations. They can handle taking a piano down a flight of stairs or removing a hot tub from a backyard. They are great problem solvers. What is it mentioned in the reviews is what happens once the crews leave a particular property. That is when they are disposing of the things they collect. Instead of going directly to a landfill, Junk King St. Petersburg will probably be making drop-offs at nearby charities or recycling centers. 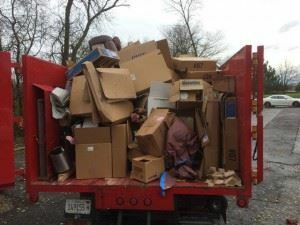 One truck full of junk could end up being dropped off at several different places. This is how they maintain their status as a green company. Judging by the reviews, it’s clear that for quality junk hauling Junk King Sarasota is the only company to consider. This entry was posted in St. Petersburg Junk Removal and tagged junk king, junk removal, reviews on September 30, 2017 by Junk King. Last updated October 1, 2017 .